Media & politics: France v U.S. In France, the regulations that guarantee equal time to all major political candidates seem to be taken quite literally. Today’s Times has a story that tells of the lengths that French media regulators go to in order to follow the letter of the law. Candidates’ appearances are timed to the second and compared to each other to ensure that no one gets an unfair advantage. The Times story compares this system to the “Fairness Doctrine,” which the FCC used to enforce on American news media. Actually, the French system sounds more like a different FCC policy, the “equal time rule,” which went out in 1960. In the fall of 1960, many Americans were still in the process of getting to know Jack Kennedy. Just forty-three years old, he represented the World War II generation, declaring himself ready to take over from Eisenhower, the very man who had commanded the young troops in wartime. Kennedy was not only young, he was also rich, good-looking, and married to a very photogenic wife. With his distinctive accent, his cool demeanor, and his ironic wit, he was well suited to the new medium that was about to make its mark on American politics in a dramatic way—television. Just in time for the 1960 election, Congress had passed a law repealing the FCC’s “equal time” rule, which had required broadcasters to give equal amounts of air time to all candidates for office, including fringe candidates and cranks. In 1960, for example, there were more than a dozen political parties offering candidates for president. It would have been impossible—and perhaps illegal—for a broadcaster to hold a debate that excluded any of them. In a step that went a long way toward perpetuating the dominance of the two major parties, Congress decided to lift that ban for the 1960 campaign and to have the FCC study the issue. 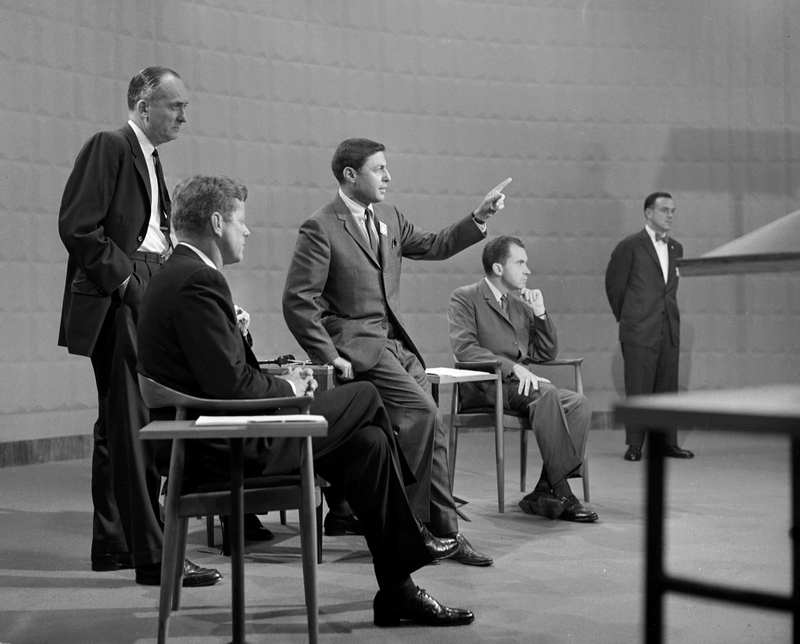 When the new law was signed on August 24, 1960, the way was clear for the networks to approach the Democrat Kennedy and the Republican Nixon and offer them an exclusive one-on-one format for the first televised presidential debate in history. The challenger, Kennedy, promptly agreed. . .
And here’s a longer excerpt that addresses the rationale for using government power to regulating broadcasting in the first place, despite the Constitutional ban on governmental limits on free speech. Meanwhile, though, with the proliferation of stations sending out signals in the mid-1920s, there arose what some people considered a problem. In more and more places, radio signals were interfering with one another, causing static and defeating the whole purpose of broadcasting. To make matters worse, some broadcasters built supertransmitters intended to overwhelm any weaker signal operating at the same frequency. In response, some broadcasters would move their signal to a different frequency, to avoid being “jammed” by a more powerful rival. As a result, listeners would have to search around the dial to find their favorite station. By 1925 there were some ten thousand stations sending out signals, with no sign of any slowdown. The existing law required a license, but it did not allow the government to deny one to anybody. Hoover and many broadcasters saw this “chaos” on the airwaves as a major crisis. The result was a drive for federal legislation. But first there was an issue to be addressed: What business did Congress have regulating this area in the first place? Specifically, what about the free speech protections guaranteed by the First Amendment? Didn’t the Constitution explicitly state that Congress shall make no law abridging the freedom of speech or of the press? Certainly, it was argued, when the Founders drafted that language, they meant to protect all speech, in all media. In the 1780s, when Jefferson and his contemporaries used the word “press,” they were referring to the entire array of mass communication then in existence: books, magazines, and newspapers. Now that a new medium had come along, why shouldn’t that technology enjoy the same protections granted the traditional print press, and for the same reasons? Radio could play an equally important role in our constitutional scheme as newspapers or magazines, but only if it was equally free. By contrast, Hoover and his allies made the case for regulating radio on the basis of what they saw as fundamental differences between the press and radio that placed the two media on different constitutional grounds. First, they said, radio exists as a result of waves that pass through the ether—that is, the electromagnetic spectrum. That spectrum is a unique public resource, and the portion of it that exists above the territory of the United States belongs to the American people. Furthermore, they said, the airwaves were not like the frontier lands of the American past, which were surveyed and sold or given away to settlers. The spectrum could be measured and divided, but it was not for sale. This idea is sometimes referred to as “listener sovereignty,” meaning that the listeners have a collective ownership over the spectrum, which gives the public the right to control it. In addition, said the advocates of regulation, the spectrum has another inherent quality that differentiates it from the traditional press: it has only so much bandwidth. As a result, within any geographic area there is a physical limit on the number of radio signals that can be transmitted without interference. This “spectrum scarcity” means that someone must serve as a gatekeeper, allowing some people to use the spectrum and keeping others out. In radio there is a natural saturation point beyond which no one can enter without harming someone else. For that reason, radio was different from the press, since it is possible to have a practically unlimited number of publications circulating in the same area without impinging on one another. With these arguments, the regulators swept aside any constitutional objections and turned to making laws that would abridge the freedom of the airwaves. The result was the far-reaching Radio Act of 1927. . .